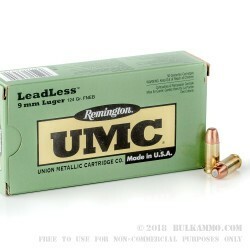 This 9mm cartridge by Remington is from their UMC line of ammunition, which is designed to virtually eliminate a shooter’s exposure to lead while firing indoors. It features a 124 grain flat nose enclosed base bullet. By enclosing the bullet’s base with its jacket, it is protected from hot propellant gasses that would have otherwise evaporated its lead core. Combined with its primer that is devoid of any heavy metals, and you’ve got an ideal round for use in poorly ventilated ranges. 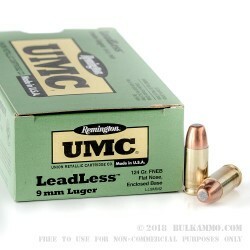 Because its bullet’s flat nose will punch a tidy hole through a paper target, this cartridge is of considerable value to competitive shooters. 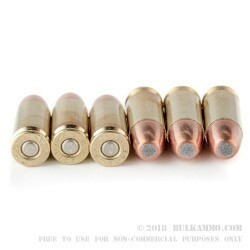 Handloaders will favor it for its reusable brass casing as well, making this an economical option if you carry a weapon chambered in what is possibly the best-known caliber on earth. Remington’s legendary reputation for quality extends back over two hundred years to when their founder produced his first rifle by hand. Theirs is a good wealth of experience to rely upon whenever you choose a new cartridge for purchase.